Last year I didn't trick-or-treat, but this year I decided to give it a try. It was awesome. Mom and Dad prepared me on what I'd need to do and what I would see. They reminded me that all the spooky stuff is just pretend. This year I was Cookie Monster. It was a great choice because it is a cozy costume and it was a bit chilly that evening. Mom took me out first while Dad stayed back with Trent to pass out candy. The first house I went to was Mr Mason and Miss Rhonda's. I made Mom come on the porch with me but I handled ringing the doorbell and saying "trick-or-treat." Mom took me to a few places and then I got to go out with Dad. They were surprised how long I was able to go. One neighbor turned their house into a big monster. It had glowing eyes in the windows and teeth on the porch. Another made his porch into a pirate ship and was shooting candy with an air cannon. That was the best! Trent didn't dress up, but don't feel bad for him. Mom had four Halloween shirts for him. He fell asleep while the night was still young. Along the way we saw the Klem family. Paige was dressed as a zombie princess. Zombies are popular. When I got home, Dad helped pick out all the candy from my loot bag that isn't safe for my tree nut allergy. I love eating candy! 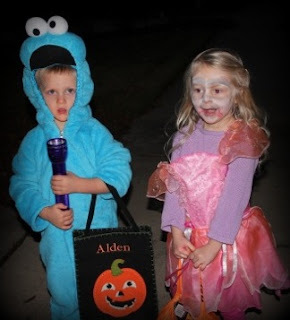 Cookie Monster encounters a zombie princess! 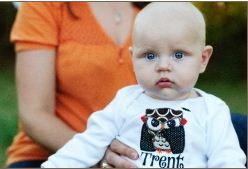 Trent in one of his Halloween shirts.